This task is simpler and much more straightforward than the design of receptor-specific arrestins. However, it is currently hampered by inadequate identification of the arrestin sites mediating its interactions with the great majority of partners. This situation can be easily remedied by systematic mutagenesis of the non-receptor-binding side of arrestins (Figs. 2 and 3). Established interaction assays with purified (Hanson et al. 2007b) or radiolabeled translated proteins in vitro (Hanson and Gurevich 2006), site-directed spin-labeling (Hanson et al. 2006b, 2007b; Wu et al. 2006), as well as cell-based methods, such as "nuclear exclusion assay" (Song et al. 2006, 2007), can be used as readouts. For example, we have recently found that all four vertebrate arrestins comparably bind JNK3 and Mdm2, which identifies a relatively small number of highly conserved residues on the non-receptor-binding side of the molecule as key players in these interactions (Song et al. 2007). The very process of mapping the "footprint" of a particular partner (e.g., by alanine-scanning muta-genesis) generates a number of mutants with reduced binding. These can be further fine-tuned to completely obliterate the interaction by combining selected mutations. Enhancing protein-protein interactions is a bit harder than destroying them, but it is feasible. Most binding sites have an area of 2,000-4,000 A2, where fewer than ten residues in each partner are in direct contact with the other. These residues are easily identified in the process of site mapping. Usually 10-20 additional side chains within the interface do not contact the partner. These residues can be replaced with those that have bigger side chains to bring them in contact with the partner. The first round is likely to yield a few arrestin mutants with increased affinity for the partner of interest, as well as a number of new mutants with reduced affinity. An additional H-bond increases free energy of interaction by 2-5 kcal mol-1, a salt bridge adds ~5 kcal mol-1, and a hydrophobic interaction up to 3 kcal mol-1. The relationship between the free energy of association and affinity, AG° = -RTlnKA (where R is gas constant = 1.99 cal mol-1 K-1; T is temperature in Kelvin, and KA is the equilibrium association constant) suggests that a combination of mutations that adds two to four direct contacts between side chains of the two proteins can increase the affinity of the interaction 10-100-fold. Mutant proteins with enhanced ability to bind particular partners are excellent tools for gene therapy, since gain of function can be achieved with a relatively low level of expression of these proteins. Loss of function, however, would require disrupting interactions of endogenous arrestins with specific proteins, which could be achieved using small mimics of arrestin elements that mediate its binding to individual partners. Alternatively, mutant proteins of a dominant negative type could induce loss of function. For example, if a mutant arrestin tightly binds one member of a signaling cascade but not the other(s) required for signaling, it would effectively act as a scavenger of the protein it binds, thereby reducing the activity of the whole pathway. 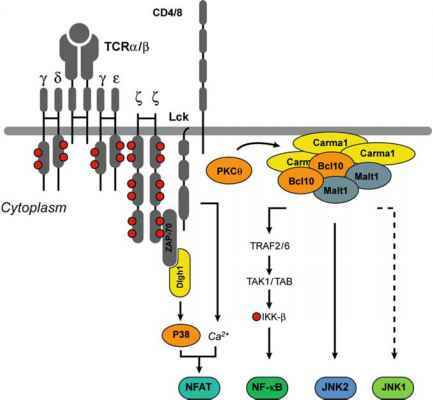 Curiously, microtubule-bound arrestin acts in such a manner with respect to the MAPK pathway: it binds ERK1/2, but not c-Raf-1 or MEK1, causing reduction in cellular ERK1/2 activity (Hanson et al. 2007b). The existence of a native arrestin conformation with such "dominant negative" properties further supports the feasibility of constructing arrestin proteins with desired signaling behavior. Additionally, as discussed above, often the same effect can be obtained either by reducing the interaction with one partner (e.g., pro-apoptotic kinases JNK3 or ASK1) or enhancing the binding of another with opposing biological activity (e.g., pro-survival kinases ERK1/2, c-Raf-1, or c-Src). Thus, the identification of arrestin elements mediating its interactions with nonreceptor partners will open almost limitless possibilities of modulating arrestin-mediated signaling in different ways. From the standpoint of therapeutic potential, some arrestin partners appear more promising than others. Arrestin interactions with proteins that enhance cell survival (protein kinases c-Src, c-Raf-1, ERK1/2, Akt; ubiquitin ligase Mdm2) or promote cell death (protein kinases ASK1, JNK3; NFkB inhibitor iKBa) are of particular interest in this regard, as discussed in Sect. 5.3.